They blamed me and said things are not fine. Just because I was dark, the night was dark too. I thought - can't they see the extra stars shine? To brighten up the night, don't they have any clue? Waxing & waning is my nature; always been so! Why so many people are complaining tonight? What's so special that they want me to glow? Why this demand to view my form that's bright? On Amavasya (New Moon night), I'm the Dark Moon. This truth has been accepted for centuries by all. But, I work as per nature; extra light I can't install! With the King's brother, after serving 14 years of exile! The public planned a grand celebration to welcome! They wanted to greet them in style & make them smile! My darkness was an issue, but that was all I could share. The public got innovative & there was the first 'Diwali'! They lit hundreds of lamps that night; it's still an annual-affair! Every home still participates in the grand celebration happily! Would the 'Festival of Lights' in this world ever be born/seen? Would they think of lighting lamps & illuminating without a fuss? What do you feel? Would the first Diwali be celebrated had it been a Full Moon Night? Do share your comments below. Diwali or Deepavali is the 'Festival of Lights' that is celebrated on Kartika Amavasya. People light earthen lamps and candles and decorate their homes with electric lights. Though Diwali was first celebrated in Ayodhya, India, to welcome the Lanka-returned Shri Ram, Mata Sita and Lakshman (as per belief), it's celebrated worldwide now. May the glow of joy, peace, prosperity and good fortune illuminate your life and your home! Thank you for your poem which has helped me to understand the origins of Diwali, Your question at the end is an interesting one. Diwali must be wonderful, with all the flickering candles. I enjoyed reading your poem, and the lunar conversation. Humans are never satisfied, it seems. Smiles. Great to read. Wishing you and your family a very Happy Diwali. Fun poem! Even the moon likes an earthly festival. And I love the moon's phases. A sparkling Diwali poem! Thanks for joining us! Wishing you a wonderful Diwali. Happy Diwali! It is still dark at night even with a full moon. Thank you for writing about Diwali. I enjoyed this. 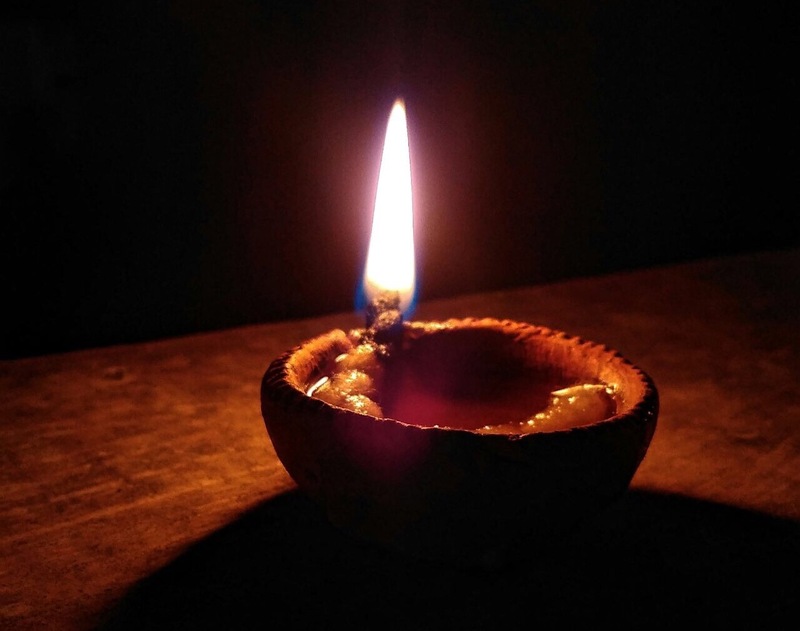 The dark night is the perfect backdrop for the diyas to burn bright. A fascinating insight into the origins of this festival. This is lovely- Thought hatke! Beautiful ! Enjoy your festival of lights!